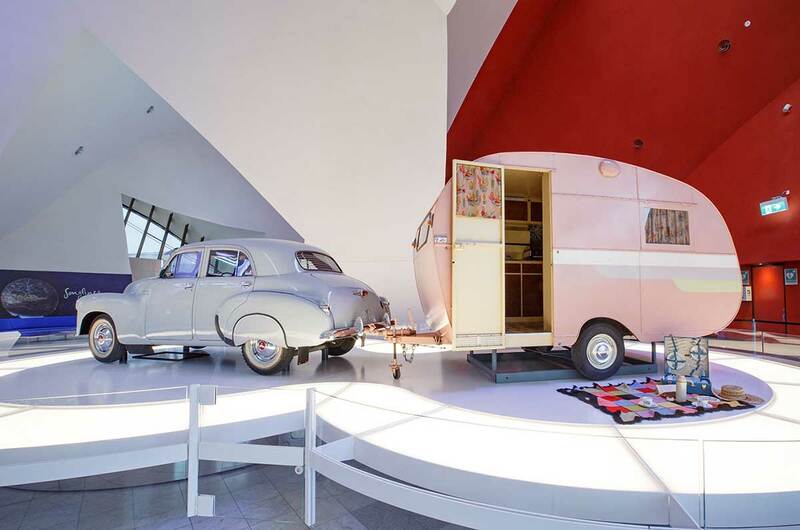 The pink Propert ‘Trailaway’ van — a one-off built in Sydney in 1956 — continues to delight visitors, with many confessing that it is their favourite object from the Museum’s collection. The caravan was on show when the Museum opened in 2001, then taken off display for several years. Last year it returned as a centrepiece in the Museum's Main Hall, which was this week renamed the Gandel Atrium. Thomas Propert, founder of the Propert Building Works in Sydney, built the three-berth Trailaway touring van. It is a one-off model for advertising purposes and was not a production-line model or prototype. It is a perfect example of 1950s style. 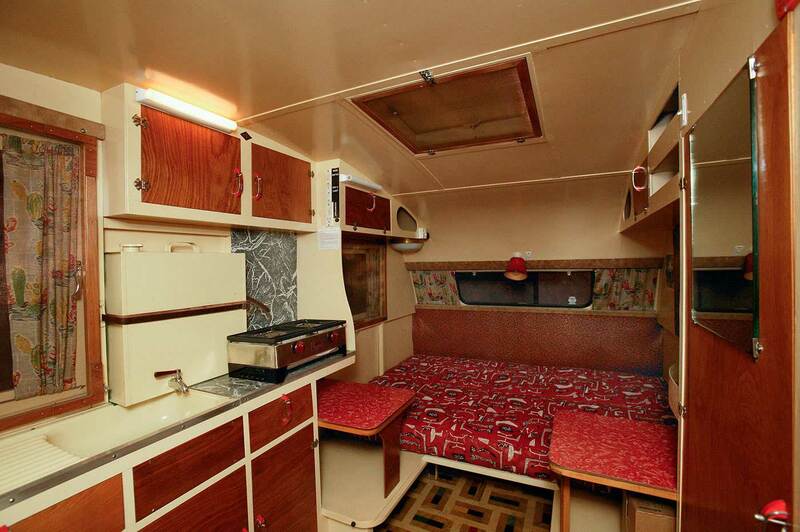 The interior has a block-patterned linoleum floor, laminex fittings, anodised aluminium kitchenware, vinyl covered cushions and colourful curtains. Advertising for Propert caravans emphasised their safety, ease of towing, high quality and clever design, and assured customers that they were ‘the ideal family caravan to suit the widely-varied conditions of this Continent’. The van is displayed in the Atrium with Molly Goodall’s FJ Holden Special Sedan, purchased in 1955. Manufactured in Australia and designed for local driving conditions, Holden cars first rolled off the assembly line at Fishermen’s Bend in 1948. Strong natural light levels in the Atrium meant that protective measures were required before the caravan could go on display. Conservation testing on the Mexican pattern curtain fabric showed that uncontrolled light would accelerate the fading and ageing processes. The curtain fabric was photographed by the Museum’s George Serras, then Museum designer Po Sung created a repeatable pattern. Facsimile curtains made with block out fabric were made to replace the originals while the caravan is on display. Clear 80 per cent ultraviolet tint was added to the windows of the van and car to help protect the soft furnishings and seats. Defining Moments in Australian History is the overarching theme of objects on show in the Gandel Atrium. The caravan, an emblem of the affluence and quality of life in Australia, relates to Australia’s postwar immigration drive and the Holden is Australia's first locally made mass-production car.